We've been led to expect good things out of the third-generation Škoda Octavia, Volkswagen's new Czech-badged C-segment entrant that rides atop the company's MQB architecture along with the new Audi A3 and VW Golf. We liked what we saw of the handsome – if conservative – standard model when it was revealed at the Geneva Motor Show in March, and now the recipe looks to be getting a bit more interesting with this new vRS model. Set to debut at the UK's Goodwood Festival Of Speed on July 10, this racier Škoda will be available in both sedan and wagon bodystyles, complete with a unique nose that includes a more aggressive fascia, honeycomb air intakes and bi-xenon headlamps with LED running lamps. Out back, the vRS receives a blacked-out rear diffuser, chrome rectangular exhaust pipes, LED taillamps and a rear spoiler. Naturally, the whole package snugs 12- to 13-millimeters closer to the ground thanks to a firmer sport suspension that rides atop any number of flashy new wheel patterns. Inside, changes are limited to the institution of new sport seats, a leather-wrapped three-spoke steering wheel with matching gearchange lever and handbrake, ambient lighting, stainless-steel pedals and sill plates, along with the inevitable smattering of vRS emblems. The Škoda Octavia vRS will race into European showrooms shortly after its Goodwood introduction, but you can learn more about it in the official press release below. Mladá Boleslav, 5th June, 2013 – The curtain rises for the fastest production Octavia ever: the new ŠKODA Octavia vRS celebrates its world debut at the Goodwood Festival of Speed ​​on the 10th of July. The Czech manufacturer continues the most comprehensive model campaign in the company's history with this latest model. The third generation Octavia vRS/Octavia estate vRS really creates a strong impression with its powerful and efficient engines, racy design and innovative technology. "The new ŠKODA Octavia vRS is in a sports league of its own," says ŠKODA CEO Prof. Dr. h.c. Winfried Vahland. "Our latest model stands for horsepower and fuel efficiency and, at the same time, for emotion and rationality. Never before has an Octavia vRS been so fast and dynamic and yet so spacious, convenient, safe and comfortable as the third generation of our compact sports car. 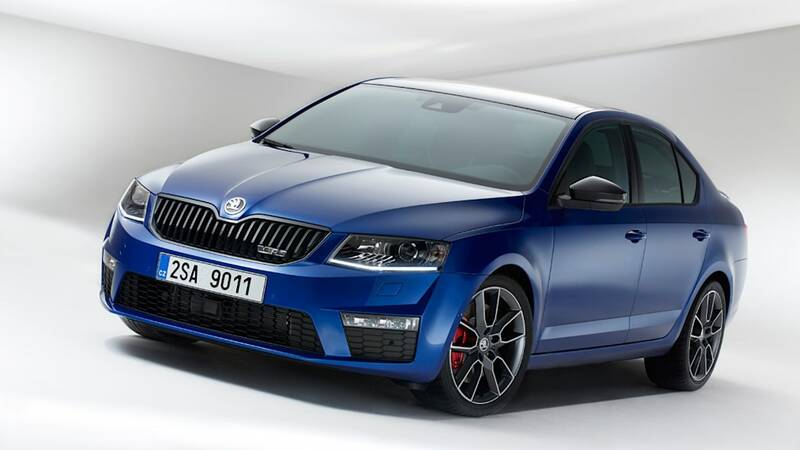 In this perfect combination, the new Octavia vRS and Octavia estate vRS set new standards in the sporty compact class and also takes the brand's sporty genes with it on the road. A perfect car for free time and everyday use, maximum power, the latest technology and great value for money," explains Vahland. Speed and class are conveyed in the new ŠKODA Octavia vRS design from the word go. 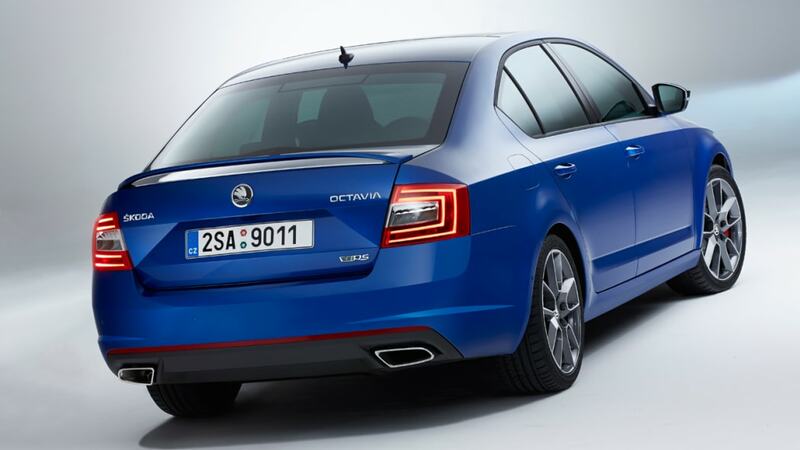 Either as Octavia vRS or Octavia estate vRS, the latest ŠKODA model really shows off its lean sporty genes. 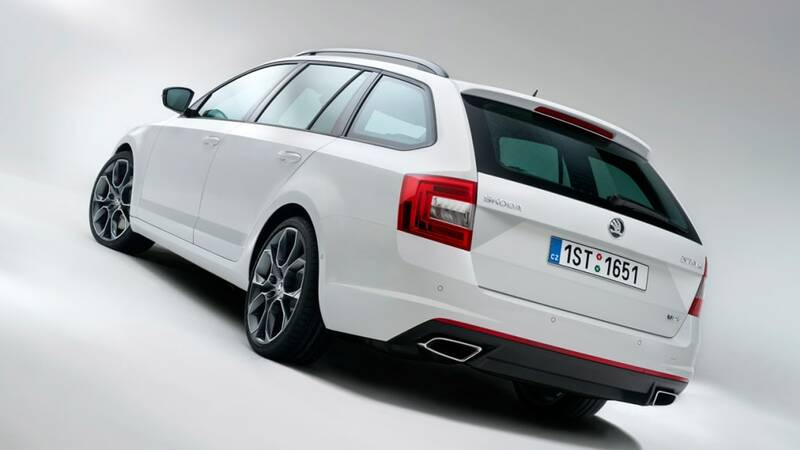 It is clear to onlookers from the start that this is the new sporty Octavia vRS and the brand's new design language shines through. 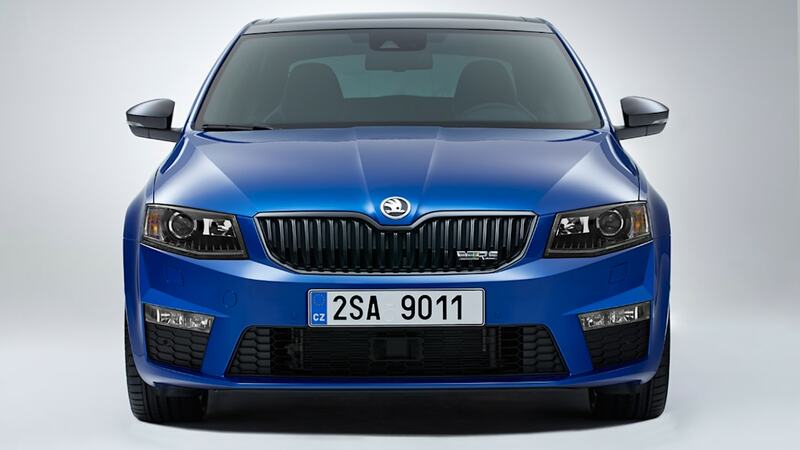 The front view is dominated by the creative interplay of the characteristic ŠKODA front grille sporting the vRS badge, distinctive honeycomb air intakes, a new vRS-style front bumper and fog lights as well as the new bi-xenon headlights with integrated LED daytime running lights now fitted as standard. The Octavia vRS's new light-alloy wheels lend the car a particularly sporty look. The designers have created four new 17", 18" and 19" wheel designs. The tyres have an impressive, racy two-tone look, a distinctive outfit, visual lightness, sharp edges and a finish precise to the smallest detail. The new Octavia vRS drives on the series standard 'Dorado' 17" light alloys fitted with 225/45 tyres. Then there are the optional 18" 'Gemini' and 'Pictoris' alloys (each for 225/40 tyres). Two colours are available for the 'Gemini': silver und anthracite. Anyone who appreciates ultra-sporty wheels will love ŠKODA's accessories for the Octavia vRS and there are yet more treats in store like the 'Xtrem' 19" light alloys in black. The rear is dominated in the lower section by a strong black diffuser element and the overlying wide reflector spotlight.These elements are also distinctive features of the new Octavia vRS just like the two large, trapezoidal-shaped chrome exhaust tailpipes. Then there are the rear lights fitted as standard with LED technology in the brand's typical C-shape. And the designers have not forgotten about the spoiler, which, on the estate vRS, is fitted as a roof-edge spoiler. In addition to its sporty features, the new ŠKODA Octavia boasts all the outstanding attributes that distinguish it as the new Octavia in both body versions. These primarily include the superior interior space and numerous 'Simply Clever' solutions. ŠKODA's well-known quality is also an integral part of the sporty version. Added to that, there are a whole host of other 'Simply Clever' features, such as the foldable cargoitems as well as the double-sided boot flooring, an ice scraper in the fuel cap and the high-vis jacket under the driver's seat. There are also litter containers, multimedia holders and a number of storage compartments, holders and hooks fitted as standard in the new Octavia vRS. The new Octavia estate vRS has an optional adjustable boot floor. The jacket shelf under the boot cover is new in the estate vRS. The roller cover for the boot can be removed and stowed under the adjustable loading floor. The backrest of the rear seat can also be folded 60:40. The car leaves nothing to be desired in terms of comfort thanks to the many on board comfort systems. As an option, the new ŠKODA Octavia vRS comes with Adaptive Cruise Assistant, which keeps a set distance from the car ahead. The new Intelligent Light Assistant automatically switches the long-beam lights on and off. The Automatic Parking Assistant supports you getting in and out of tight spaces. The road sign detection in the 'Traveller Assistant' package indicates traffic signals. KESSY Keyless-Entry-Start-and-Exit-System is also available upon request for the new Octavia vRS along with the electric panoramic sunroof for both body versions. In addition, there is a completely new generation of infotainment radio and navigation systems. Swing – the CD/radio with TFT monochrome display is also fitted as standard in the brand's latest model with four front and rear speakers. Up to eight full-size touch screens with proximity sensors are fitted in higher systems. The CANTON Sound System offers passengers sound-optimised audio for pure listening pleasure. is one of the oldest vehicle production companies in the world. Since 1895, the Czech headquarters in Mladá Boleslav has seen the production firstly of bicycles and then, shortly afterwards motorbikes and cars. currently has seven passenger car models: Citigo, Fabia, Roomster / Praktik, Rapid, Octavia, Yeti and Superb. in 2012, delivered around 939,200 vehicles to customers worldwide – up 6.8 % on the previous year and a new record. has belonged to Volkswagen since 1991. VW Group is one of the most successful automotive groups worldwide. ŠKODA, in association with the Group, independently manufactures and develops vehicles as well as components, engines and gear transmissions. operates at three locations in the Czech Republic, produces in China, Russia, Slovakia and India - mainly through Group partnerships. employs over 26,400 people globally and is active in more than 100 markets.